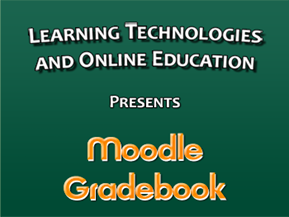 Are you interested in taking advantage of Moodle’s Gradebook features? Join LTOE’s Justin L'Italien as he walks you through the basic process of building your Moodle Gradebook. This exclusive web conference will take place on Tuesday October 8th at 12:30 pm EST and then again on Wednesday October 9th at 7:00 pm EST via a virtual meeting room (Adobe Connect). To access the meeting room, please click on the following link a few minutes before the start time: http://plymouthstate.adobeconnect.com/r2rzz6y48yi/ (login in as “Guest”). A recording of the session will be available on CETL’s website following the workshop. The first 30 minutes of the session will cover the basics of setting up Gradebook and the remaining time will be spent answering specific questions from attendees. Please see CETL’s web site for a broad range of teaching and learning announcements and events!